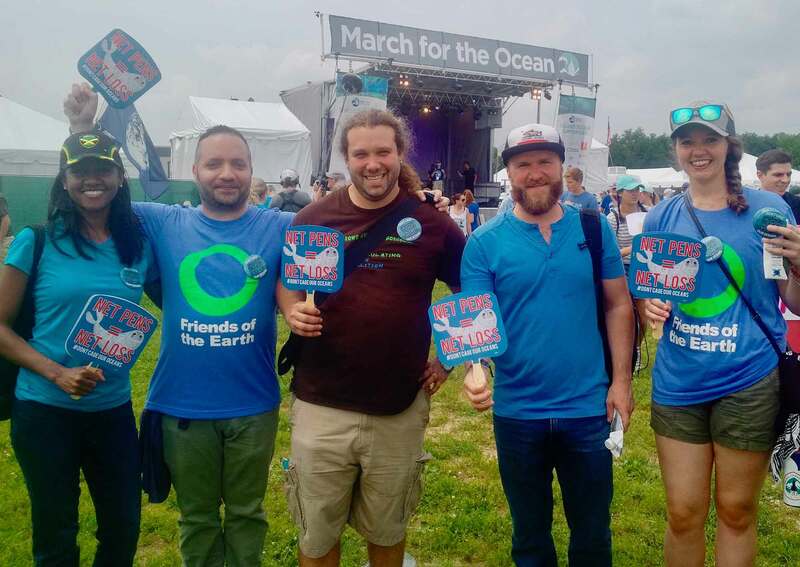 Hundreds of people joined together in a March for the Oceans on June 9th in Washington, DC, just following Capitol Hills Ocean Week. A strong contingent of participants wearing pins and carrying signs with the hashtag “#dontcageouroceans”, were there to oppose the development of industrial ocean fish farms, including those from: Friends of the Earth, Recirculating Farms Coalition, Pacific Coast Federation of Fishermen’s Associations, Gulf Restoration Network, and Green Justice Legal. Over the past 15 years, Congress proposed draft laws that would permit industrial finfish farming around the U.S. However, overwhelming public opposition stopped enactment of such sweeping federal laws. Now, Capitol Hill legislators are developing a new initiative for industrial aquaculture in U.S. waters. Opponents are collectively rising to protect fishing communities, public health and our oceans. Diverse organizations are rapidly joining the campaign to stop industrial finfish farming. Many are planning activities to reach out to others and get them involved in protecting our oceans. Sign the petition to stop industrial ocean finfish farms here.